Perhaps the best white flowering deciduous Magnolia, Magnolia Lennei Alba is strong growing and holds its flowers well. 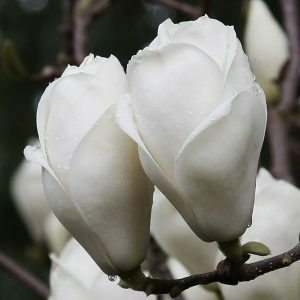 The full name is M. soulangeana Lennei Alba, this is a hybrid between M. soulangeana and Magnolia denudata or ‘Yulan Magnolia’. Large goblet shaped flowers appear on bare stems in spring. A subtle lemon fragrance is evident, and the petals of ‘Lennei Alba’ are thicker than many others, making them more resistant to the spring rains and wind. We consider it to be faster growing than M. soulangeana itself, and also better in warmer areas. Growth rate is still on the slow side, taking around 10 years to get to 3 metres in height. This will depend on the soil and climate. As this is an early flowering variety, Lennei Alba is best planted in a open position. It will perform best in good light, in a humus rich well drained soil. Choose a position with some protection from the hot afternoon winds. Choose a position where it has room to grow and will not be disturbed. Like most deciduous Magnolias, Lennei Alba does not take well to transplanting once established. The root system is shallow, so simply mulch around the plant to the drip line. This will help maintain some moisture, a cool root run and protect the root system. This is a frost tolerant plant and requires little to no pruning.